It’s not just a vintage clothes shop; I wouldn’t have fallen in love with this place if it were just a vintage clothes shop. SiTenne is a family. 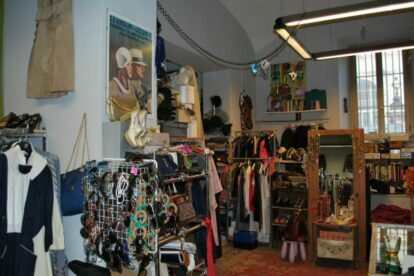 Close to Piazza Vittorio, the shop is run energetically by the owner Alberta, her inspiring American muse Giulia, with genial incursions by the creative Valerio. SiTenne means “we have kept it”, because the used clothes in this shop find a second youth. You can stop there if you want to try and buy famous clothes from the ’20s to ’90s. It’s a unique place, for sure much more for women than for men. You’ll always find a young and pleasant ambience (if you are nice and it’s aperitif time they will invite you to join for a beer). The artisanal clothes are unique because here they cooperate with artisanal tailors who work with movies and theatre productions. You can also just rent and not buy the expensive quality clothes and have an unusual fancy party for one night with a bunch of your friends. Inside the shop they also have a bookcrossing and photoshooting service. When I hopped into SiTenne for the first time, the owners were happily playing a dice game called Yahtzee with some of their friends: that’s the spirit I fell in love with.